We’re still adjusting to the destruction and havoc caused by the Typhoon Haiyan in the Philippines, and there’s plenty more we don’t know about, so it seems almost churlish to look at the crisis communications involved while there’s still so much suffering on the ground. But I want to applaud the comms efforts of the Aid agencies, particularly Oxfam and the DEC. And criticise the automated ad-booking systems of Expedia and Booking.com (amongst others). I regularly look at how corporates respond to a social media crisis, or a crisis that plays out in social media. Typically it’s about them and how they react. But something like the typhoon is much bigger than that. It’s about how the world reacts. And how (in many cases) the Governments and Aid agencies act to motivate people to donate. In this case, the speed at which the Aid agencies have acted both operationally (getting people on the ground) but also in comms terms has been extremely impressive. The use of ‘dark sites’, populated extremely quickly and updated in real-time is commendable. 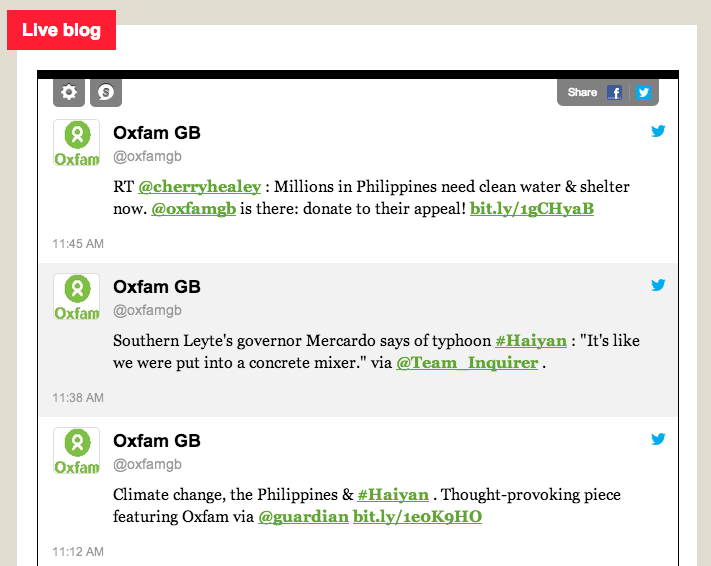 The DEC have got a decent site live, but Oxfam’s is really very excellent. In particular the way they’ve rolled in a liveblog to publish their news and collate others’. Fingers crossed it helps increase donations, and then action. But on the other hand, we have Booking.com and Expedia. 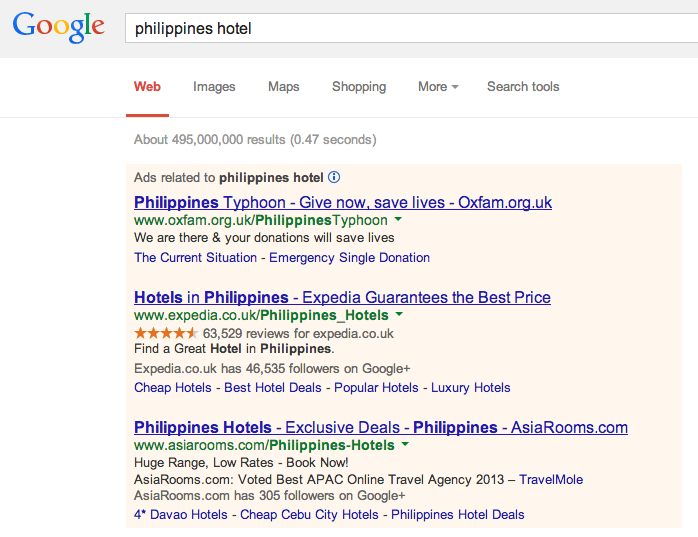 Really, did no-one think to stop buying ads against Google searches for ‘Philippines Hotel’? At least for a week or so. Hats off to Oxfam (again) for bidding for the top spot, but, while I appreciate Expedia, Booking.com, Asiarooms etc. have businesses to run, surely they could put one aspect on hold for a little while?